Ok, so this issue has been bothering me for quite some time. I'm posting in the beginners' section because I'm a beginner, but if moderators think it's advanced enough, then by all means move it. My question is: why do armscye drafts slope downward toward the front of the shoulder? This illustration I quickly made demonstrates my point. So, am I freak or is there something else happening here? Also, does this explain why my shoulder always feels like its poking through the front of my jacket instead of sitting in the scye? This is a fitting problem. The scye is in the wrong place. You probably need a wider back or the front needs to be wider in the scye at the seam that connects to the back. It could be another problem of many. With inlays you can experiment with a number of ideas and reading fitting. I think it's probably a fitting issue. I'm re-reading the thread on armholes and it sounds like my problem is the all of my coats so far are ready to wear. On my coats, the backs are too narrow, the fronts are too wide, and the armholes are too deep. This is part of the reason why I'm learning to do this on my own. Raise your arm over your head. Where is your armpit located? It's to the front of the body. This is because the arms hang to the front, not the side. Draft the body. Fit it. And then mark on the muslin where the finished scye should be located. Don't get caught up in the details of the system. Practice it until you have a good reason to break it. But doesn't that have more to do with where the scye is located and less about the shape? You may not know it. But, you're broaching a philosophical debate about range of motion and composite norms. You may have a shape that differs from the drafting system. It doesn't mean that either of you is flawed. It may mean that you need your garment custom made. Make a muslin and fit it. Draw in where the finished armsceye needs to be for your body - every body is different. Transfer those changes to the pattern. Continue as often as required. So many, it seems, are so flat like they are made for a suitcase. Ok, so I'll take you at your word. I'm going to do the muslin thing until I get it perfect. Just one question, how do I fit the muslin mock-up if I'm supposed to draw the armscye afterward? As for the philosophical debate: yes, I was trying to start one. And just so nobody gives me credit where it's not due, that's not a coat I made in the picture. ...but those are nice lapels, aren't they? You execute the draft as it's written. Then widen seam allowances in the scye area - say 1". Baste the body together and try it on. You should expect to pop basting threads in order to get your arm through the hole. Once on the body, you take note of creases and pulls and decide where you want to place the sewing line for the scye. It will take trial and error. I used to cut the scye too deep. It took a while to learn that I limited the range of motion because I clung to a misperception. After many mistakes, I learned where I think the scye seam should sit on the body. My opinion on that may differ from the next guy's. But, that's OK.
You'll find that I will try to encourage you to exercise before you analyze. Without a proof to refer to you can't discuss the theory in a specific context. If you take a vertical cross-section of your arm it will be an oval pointing forwards and downwards. But we'll all see soon. I'm currently working on fitting a muslin coat and then we'll have experimental results as to what the scye looks like together and as a draft. I don't know if anyone has addressed this specific question yet, and I hope that someone will jump in to correct me if I'm wrong. If my understanding is correct, at least part of the explanation is due to the darts. 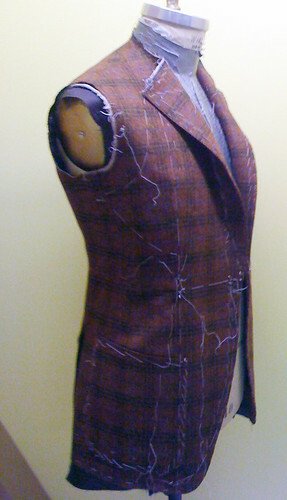 This might be easier to describe in two dimensions: if you were to draw that draft on a piece of paper, then slash and close the darts along the waistline (allowing the bottom parts to overlap), it would lower the back portion of the scye making something closer to the more round bottom shape you see in the (not quite) finished coat. The other, and more difficult to describe factor is the fact that the front and back of your underarm are probably not equidistant from the center of your body. That is to say, if you were to grip a ruler under each arm, they probably would point at each other. In my case (and I assume most cases based on the typical scye shape in drafts), because my back is broader than my front at the base of the scye, the rulers would be angled to converge on a point somewhere in front of my body. It is for this reason that when you wrap the scye around my arm, the distance from the center of my underarm (or the center seam) to the base of my rear deltoid is longer then the distance to the base of my front deltoid, even though they appear equidistant when viewed in full profile as they are in the draft. You can kind of see what I'm trying to describe as the shadow between the coat and the back of the form in the picture. I'm having trouble describing it, but you can see that if you shaped the back like the front, the back would expose your latissimus dorsi instead of hugging your shoulder joint. You're right. The darts along the sideline factor in. They make the "forks" of the back and front pieces splay apart. But, the best way to test this is to compare the garment to the draft. When you've taped the lower part of the scye and the back panel, the curves will become more pronounced and about 5/8" shorter. When you stretch the top of the front scye, it becomes about 5/8" longer. After that's done; but, before you close the shoulder seam, assemble the pattern pieces matching the sewing lines from the waist notch upward and then lay the garment on top. It should become clear how the draft takes into account the fulling & stretching techniques. You can cut a garment to eliminate the fulling & stretching techniques by manipulating the fullness and shortness, elsewhere. It depends on the targeted pricepoint and the factory where the garment will be made. But, this specific draft is designed for the tailor shop. Thanks for contributing to this thread. I always like reading your posts. So a garment that wouldn't be subjected to extensive iron work would be drafted with a "rounder" scye? It's partly to do with mobility; the arm tends to move forward more often than backward, and when it hits what is sometimes a very firm chest piece, it can be uncomfortable so the scye is scooped a little in the front. The back is raised a bit to give a little more movement- like a high armhole gives more movement, a forward-pitched armhole does the same, at least when reaching forward. Hold your coat closed in the front with one hand and reach your other arm forward, noting how it feels, now swing your arm backward. You will likely feel the resistance as you reach backward because of the front scoop but much freer to reach forward because of that little extra cloth. Careful not to overdo it, though because it can end up being messy if there is too much. jefferyd, is that your coat in the example pictured? It seems that I'm getting some nice answers, thank you! To summarize, the back is longer across than necessary so that the cloth continues (for a tiny bit) without following the curve of the body into the underarm. This is done to increase range of motion forward at the expense of some backward range. Furthermore, a bit of cloth is correspondingly removed from the front, again in order to increase forward range of motion. Translating this into a two-dimensional draft (which itself will be somewhat distorted when the cloth is manipulated into a three-dimensional coat) the scye is raised from from horizontal in the back (adding a bit) and lowered from horizontal in the front (removing a bit) giving the draft the forward sloping oval appearance. Boy that's a mouthful! Comments?